You are here: Home » Articles » Osteoporosis Exercises » What is a Set and a Rep in Exercise for Better Bones? Sets and reps are an integral part of most exercise programs, including the Exercise for Better Bones program. It is important that you understand what is a set and a rep in Exercise for Better Bones before you start your program. Reps refers to the number of repetitions I am prescribing for your exercise level. You should choose a weight (if the exercise includes a weight) that fatigues your targeted muscles within the range of reps listed in your Exercise for Better Bones exercise schedule. Sets refers to how many times you should do the prescribed individual exercise. For example, I may recommend 10 to 12 reps for a specific exercises. Those 10 to 12 reps make up one set. Your Exercise for Better Bones exercise schedule order is important and you should execute the exercises in the order I recommend. You should only do one set at a time. After you complete the first set, then you can do the second set. Keep them in sequence. If you can do a third set, go for it! One of the first things that you should do after you sign up and register for your MelioGuide Exercise for Better Bones osteoporosis exercise program is download your twelve week schedule. Sets and reps are included in your schedule. Your printed manual contains a complete description of each of the individual exercises in your program. Descriptions of the targets and steps involved in the proper execution of the exercise, as well as the photos, are included. Your exercise schedule will include the number of sets and reps for each of the exercises. In the video, I describe in detail what I mean by sets and reps.
We used to offer the Exercise for Better Bones program only on our website. Now we sell the book on Amazon — making it more accessible and affordable to more people than ever before. The schedules I refer to in the video are still available but now we post them on one of our sites for easy download. Instructions on how to download are explained in the book. Should You Do More Sets and Reps? 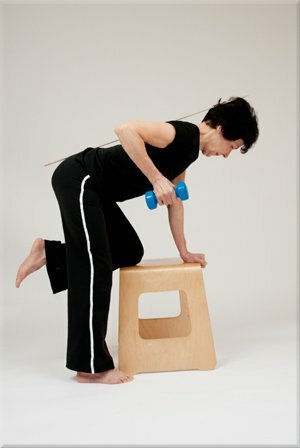 An Exercise for Better Bones client recently asked me several questions related to her work out routines and specifically her osteoporosis exercise program. Specifically, she wanted to know if her weight bearing exercises would be more effective by varying the weights, number of repetitions and frequency of her work out routines. Ellen (not her real name) lives in Vancouver. After completing her assessment that collected information on her medical profile, her T-Score and her exercise history, she was assigned an Active level osteoporosis work out routine. Ellen is half way through her 12-week work out routine and has several questions. Is it more beneficial for my bones to exercise only 2 sets of 12 repetitions or sometimes do 3 sets of 15 repetitions? I love to exercise and sometimes I feel good to do more. More repetitions are not always better for your bones. When people do more reps in a set, this usually leads to lighter weights. I would encourage you to add another set. However, do not reduce your weights so that you can reach 15 reps. If you are managing to do 15 reps in a set, I would encourage you to increase the weights you are using so that you fatigue by your 10th or 12th rep.
Will I Benefit From More Frequent Exercise? I do all the exercises every other day. Is this a good practice or would I be better off and have a faster progress if I exercise every day? In my response to Ellen regarding her question on exercise frequency, I mention the 6-day a work out routine in the Exercise for Better Bones program. There are two options for exercise schedule: 6 exercise sessions per week or 3 exercise sessions per week. Muscles need time to recover. When you work the same muscles every day, they do not get any recovery time and you increase your risk of injuring yourself. It sounds to me like your intensity is too low. If you like to work out daily, I encourage you to look at the 6 days per week schedule. You can push harder and even add a 4th set if you wanted to since there are fewer exercises and you have more time to recover.